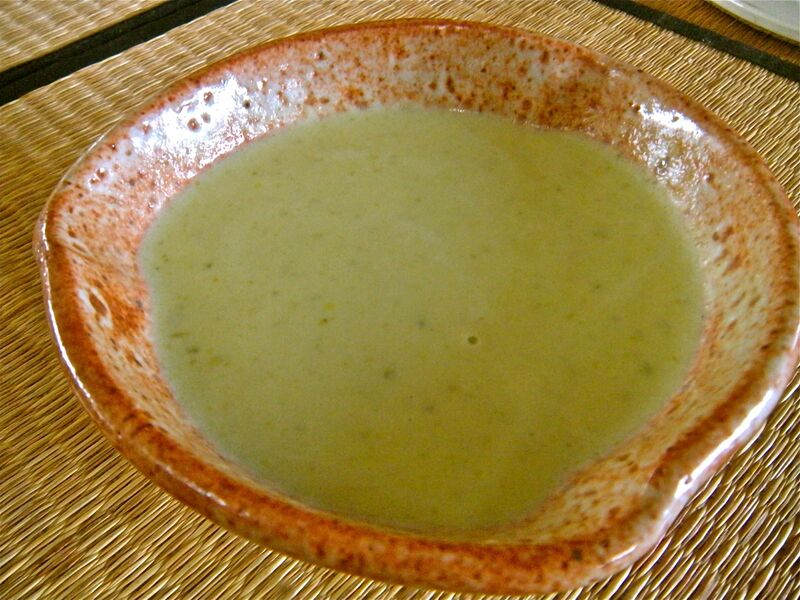 cucumber soup! . . .
English cucumbers have been on sale at the market and I usually have one or two in the fridge. They’re crisp and flavorful to add to salads or to combine with wakame seaweed for a quick asian relish. This morning, I thought it would be nice to have cream of cucumber soup for our lunch. It’s such a simple recipe and takes no time at all. Wash the cucumber and slice lengthwise. With a spoon, gently scrape out the seeds; then rinse and cut the two lengths in half again. Then cut up into pieces about half an inch cubes. Melt some unsalted butter in a 1.5 quart pot, chop up half a vidalia onion and stir fry in the butter along with the pieces of cucumber. When the vegetables have nicely browned, add 1/2-2 cups of chicken stock and cover, simmering for a half hour until tender. Let cool with the lid off. When soup is room temperature, pour into a blender and process into a smooth consistency. Pour back in the pot and add some light cream – a 1/2 -3/4 cup. Taste it for seasoning – I didn’t add any salt but it’s up to you. This cream of cucumber soup is light, tasty and so easy to make – I could probably eat it every day!